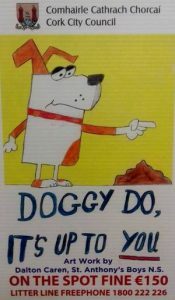 Congratulations to all the boys from 4th & 5th class who participated in the 2019 ‘Anti Dog Fouling’ Primary School Poster Competition, organised by Cork City Council. The overall winner in Cork was Dalton Caren from 4th class. His winning poster will now be widely used by the Council. Dalton received a beautifully engraved plaque. St Anthony’s also had 13 runners up, each receiving a €25 voucher. Our school was presented with a cheque for €500. A big thanks you to Councillor Paudie Dineen, Michael Sheehan and Noel Long (Litter Warden Supervisor).